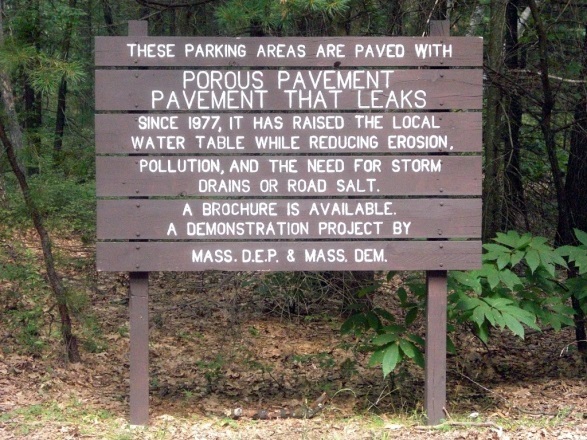 Since the 1960s when the concept of porous pavement was proposed to “promote percolation, reduce storm sewer loads, reduce floods, raise water tables, and replenish aquifers” the concept has been discussed and refined. The concept and application was so appealing that in 1977 the Walden Pond State Reservation in Massachusetts used the material for the parking lot of their visitor center. Since that time it has raised the local water table while reducing erosion, pollution, and the need for storm drains or road salt. They continue to use porous asphalt today to protect a site that serves as one of our most treasured literary muses—Walden Pond. Traditionally pavements are designed to allow rainfall and runoff to flow along the pavement surface, draining into adjacent catch basins and/or ditches of roads or parking lots. Porous asphalt pavement, on the other hand, is a type of type porous pavement structure specifically designed to allow rainfall and runoff to flow into and through the pavement structure. 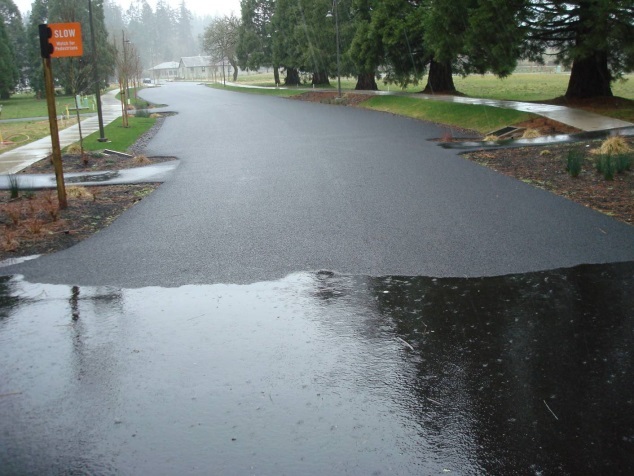 Porous pavement offers the potential to collect and/or slow the rate of run-off from other impervious surfaces. According to the Environmental Protection Agency (EPA) the potential benefits to stormwater management of porous pavements include water treatment/ pollutant removal, reduced or elimination of the need for curbing and storm sewers, and recharge local aquifers. The surface course typically consists of a 50-100 mm (2-4 inches) of a specially designed porous or open-graded asphalt mix. This mix is often referred to as an Open Graded Friction Course (OGFC) and has other applications on conventional asphalt pavements. The filter course ranges between 50-75 mm (2-3 inches) consisting of open graded crushed aggregate (either treated with asphalt or untreated) that provides filtering capabilities as well as a providing a suitable platform for paving. The reservoir course is comprised of 50 – 75 mm (2-3 inches) single sized aggregates at a depth determined by the storage volume required. Reservoir depths typically range from 10”-36” in depth. Today, porous pavements are just a small fraction of all pavement installations. However, their popularity is steadily increasing on a percentage basis, and they have been installed in all regions of the United States. Pringle Creek in Salem, Oregon was conceived as a low-environmental-impact community, from its building designs, landscaping and energy systems, to its stormwater control scheme, which relies on roads and parking lots made of porous asphalt pavement to filter and store stormwater and allow it to percolate back into the ground rather than add to the loads on drainage systems that flow into creeks and rivers. The system worked well from the beginning, but no one knew for sure how it would perform in severe conditions. So it was a true “watershed” moment in time when an epic storm flooded roads and rivers all over the Salem area in January of 2012, while Pringle Creek experienced nothing more than a puddle or two. 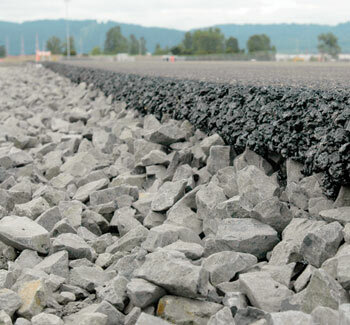 Porous asphalt surface mixes are also used by highway engineers but instead of putting it over a stone recharge bed, they use it as a thin surface layer on conventional highway pavements. Rainwater sinks directly into the surface, and then hits the impermeable asphalt layer below forcing the water to drain off to the sides. 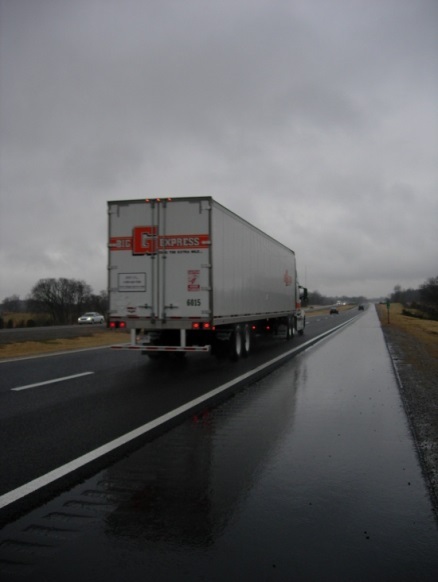 Even in a driving rainstorm, splash and spray from trucks disappears. Visibility for drivers is so much better that crashes and fatalities can be greatly reduced. 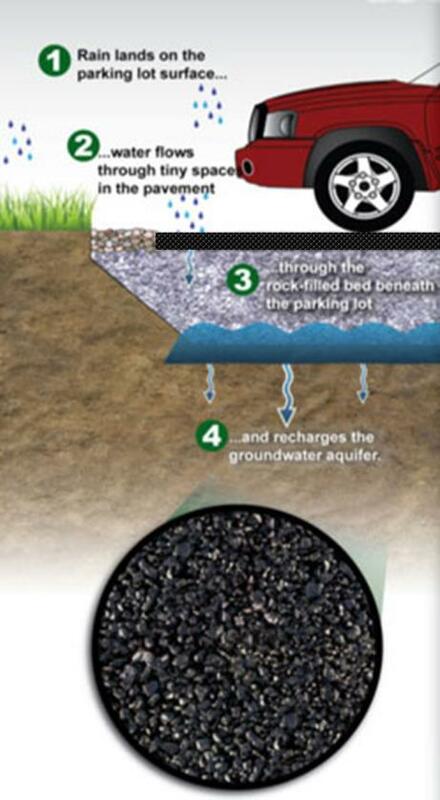 Although they are thin, these porous asphalt surfacings also improve water quality.